Recently, Pectin (PEC) and Aloe-Gel (AG) have received great attention for their use in the encapsulation of hydrophobic bioactive compounds such as Carvacrol (CAR). The aim of this study is to assess the physical, chemical and biological properties of a novel PEC/AG film and evaluate its capability to entrap CAR into microencapsulates. For this purpose, the casting method was used to prepare the PEC/AG membranes (70:30 % w/w). The CAR-loaded PEC/AG film was prepared adding different proportions of CAR (0.25%, 0.50% and 1.00% v/v) to the mixture of PEC/AG, previously emulsified with tween 80 (1.0%). 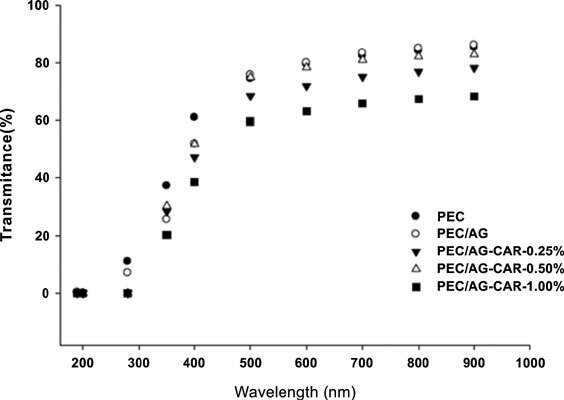 The optical properties, Water Vapor Permeability (WVP), ATR-FTIR spectroscopy, microstructure, antibacterial activity and size of microcapsules were evaluated. The PEC/AG membranes loaded with CAR showed yellowish appearance and they were transparent to the UV electromagnetic radiation (190, 200 and 280 nm). The film prepared with the lowest amount of CAR (PC/AG-CAR-0.25%) showed the highest values of WVP (66.2%) and, according to SEM micrograph, the largest microcapsules (≈1005± 39 µm3). The FTIR analysis showed the characteristic absorption peaks located at 1015 cm-1 to 1030 cm-1 and a small shoulder to 990 cm-1 of benzene ring 1:2:4 substituted that suggested the presence of CAR-loaded in the PC/AG film. On the other hand, E. coli O157:H7 showed the highest sensitivity to the PEC/AG-CAR-1.00% film, while S. aureus was not sensitive. Pectin, Aloe-gel, Carvacrol, Microcapsule, Antibacterial, Films, Membranes.